I know we promised to keep things simple, but a little bit of science is in order here. Understanding what hydroponic fertilizer solutions are made of will help you become a better urban farmer! First, some basic information on hydroponic nutrients. Later, we give you some really neat tips and tricks to make reservoir maintenance a snap! So stay with us for the good stuff. In hydroponics, you take soil away from the plant, so you must supply perfectly balanced and complete nutrition for it. just remember, plants do not need soil… they need nutrients. Plants need large amounts of 6 macro-nutrients: Nitrogen (N), Phosphorus (P), and Potassium (K). The NPK numbers you see on a manure or fertilizer bag (like 30-10-30) are simply telling you at what ratio these three macro-nutrients are mixed in that bag of fertilizer. The other 3 macros are calcium, sulfur and magnesium. All 6 are provided in the proper ratio in all hydroponics solutions. 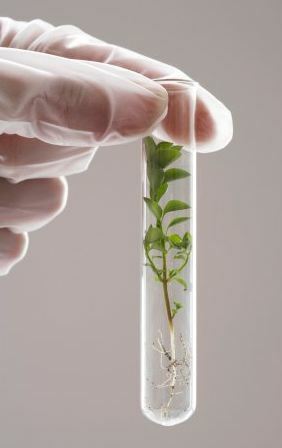 Plants also need micro-nutrients (minute traces of other elements) in order to thrive, just like you do. The nutrient solutions you buy for your 'ponics garden are different from ordinary plant fertilizers. They include all the trace elements, too. So hydroponic fertilizer is kinda like your One-A-Day Vitamins; it contains the major necessary elements as well as traces of iron, boron, manganese, zinc, molybdenum, copper, cobalt, chlorine, selenium and silicon. Yum! Remember pH from chemistry or biology class? All pH is is a number that tells how acid or alkaline your solution is. This is important, because if the pH is not in the proper range, hydroponic fertilizer nutrients get "locked out" and the plant can't get to them. Luckily, pH is a very easy thing to control. 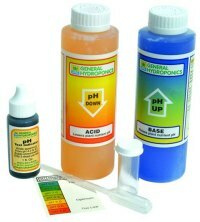 All you need is a pH test kit (like for swimming pools), or pH "dip" strips. Both testing methods are inexpensive and very easy to learn. You do NOT need to buy an expensive electronic pH meter. The proper range of pH for your nutrient solution: 5.5-6.5 (6.0 is ideal). Twice a week thereafter. If you are a worrier, test your hydroponic solution daily. It only costs a few drops of test solution. Buy a "pH up & pH down" kit. Follow the directions on the bottle. A little bit goes a long way, so be careful. You'll soon figure out how much is about right. In a pinch (if you run out of the kit solution), you can fix the pH with these "home remedies". White vinegar will lower the ph; baking soda raises it. But these agents are not stable and buffered, and should not be used in the long run. Hey, want to see our video on pH testing? Most of the information is already said above, so the tape is a little redundant. But Simon made this vid for You Tube, so we thought we'd post it here too. Which hydroponic fertilizer mix is best? Only buy solution formulated specifically for hydroponics. Regular fertilizer or Hyponex will kill your garden. Buy the best quality nutrients you can. It makes a difference, and a little bit goes a long way. Don't put together a cadillac growing unit, then try to economize by using cheap nutrients. You'll be crying in your onions! Do not buy "organic" nutrients. Organics require decomposition (composting) which creates inconsistency in the solution and your results; something you are trying to eliminate. "Organic" sounds good... but it's not... not for beginning hydro. Maybe a project for later, when you're more experienced. One-part solutions are simple and easy, but are not flexible. Two-part and three-part solutions allow customization and experimentation, and give better results. K.I.S.S. : Use the same nutrient solution that NASA does, the best: General Hydroponics (GH) Flora Series Nutrients. And forget the mixing charts on the bottles. We've figured it all out for you in the next section, The Reservoir. We also provide some links for ordering this superior nutrient system on that page.